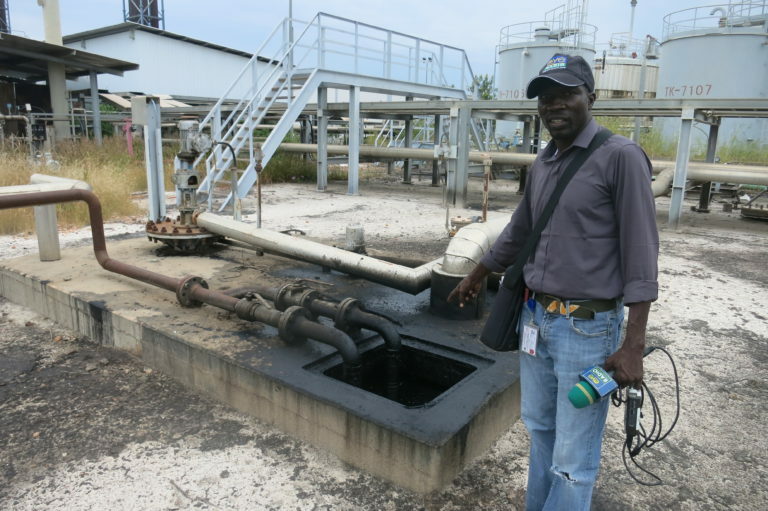 Eye Radio’s Joakino Francis during his field visit to Unity Oil Fields 12th Oct. When one thinks about oil, the first thing that comes to mind is wealth and a more prosperous country. However, we do not talk about the health hazards that come with it, especially on the people living near the oilfields and the environment. In collaboration with the Ministry of Petroleum, Eye Radio sent its geo-Journalist, Joakino Francis to Toma-South and Unity oil fields (Block 4) in August and October 2018. Joakino traveled together with a delegation from the Ministry of Petroleum for an assessment of the extent of damage the 5-year civil war caused on the oil fields. This trip was significant for Joakino who managed to observe and reported the state of the oil fields. He also had the opportunity to verify reports of pollution affecting the inhabitants, environment and water resources. Joakino says he witnessed the pollution during his visit to Ruweng State and Northern Liech State with government officials. In 2009, Joakino graduated with a degree in Information and Technology in Uganda but when he returned home he was unable to get a job. Later on, he enrolled at the University of Juba and specialized in geology. Joakino dream is to work with one of the state-owned oil companies so that he can work closely with foreign oil companies exploring the oil in the country. “I want to work with the government to ensure that the oil companies that are operating in oil fields take care of the environment,” he added. Through Eye Radio, Joakino was invited by the Ministry of petroleum to witness oil production in Toma South. This was the first production after the crisis that took place in the country in 2013. During the trip, he was accompanied by government officials. “The first trip it was on 25th August 2018”. He reminisced. In attendance was the Minister of petroleum, Ezekiel Lol Gatkuoth, Minister of the environment, Josephine Napwon Cosmas, and Minister of Forestry, Betty Achan Ogwaro. The role of the government officials was to make sure the environment is protected and to assess how they can resume the production in other oil fields in Unity state. As they continued the tour he discovered that since 2013, crude oil has been left in a pond which was filled with oil. The area was not destroyed by war, but it was looted. By the time he visited the area, they had just started cleaning up the environment. When Joakino was in the oil field he was told to walk with caution. The place was secured by a rope that did not indicate that there is danger ahead. The residents were only compensated with oil containers that had been used during the oil production, for fetching water. “These companies when they come, they promised that they will bring schools, instead they are giving you containers, chemical containers to the people in the area to fetch water or store their water,” he said. The second trip was on 12th October this year with the same Ministry of petroleum and Gas who gave him an invitation to Heglig. This time the team comprised of two ministers, went to Unity Oil Field to assess the facilities and gave a press brief afterward. The two ministers said they were devoted to ensuring the resumption of oil is witnessed in unity oil field. The government aim was to produce 45, 000 barrels per day pumped from South Sudan to Heglig, which is in Sudan. But they did not reveal the exact date and amount of money needed for the resumption. Joakino is still waiting for an invitation to witness the resumption. When he interviewed the residents in the area, he was told that there has been an increase in the number of women who have had stillbirths and deformed children. Other effects that they voiced were skin rashes, eye disease, and sudden death. 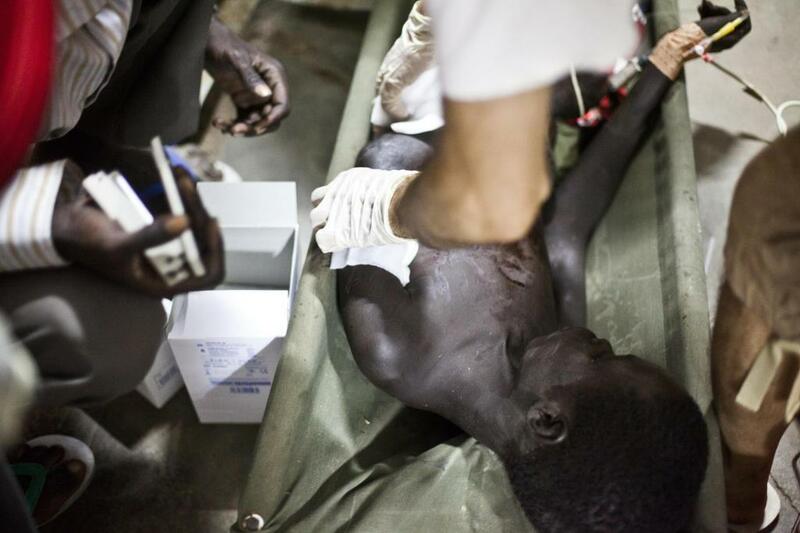 According to German NGO, Sign of Hope, more than 180, 0000 South Sudanese people who live near oil fields use water that is contaminated by the oil companies. It stated on the website that water contamination is dangerous for people’s health, livestock and the environment. A report from the Nile Institute for environmental health has also revealed some boreholes are salty due to oil deposits from oil exploration. The research implied that the contaminated water with chemicals has been exposed people living in oil production areas to health risks. According to researchers, the communities living close to the oil wells often complain of pollution that results to illnesses. Environmental campaign groups say this is due to lack of measures to properly dispose of waste in the oilfields. For his part, the Minister of Petroleum, Ezekiel Lol says the government has signed agreements with petroleum companies to ensure that the environment is protected from pollution so that the local people are not affected. “We have an agreement to make sure that the commissioning after production is realized and we will make sure that the environment is protected and if the oil is depleted, we will put back the environment as we got it,” Mr. Lol said while speaking during the resumption of the production in Toma South in August 2018. Meanwhile, the Minister of Environment and Forestry, Josephine Napon, appealed to the oil companies to actualize the agreement. “As we get money also from the oil, we also need to look into the lives of our people. I really urge and I tell the companies actually to look into the issues of the environment,” she said. Petroleum ACT 2012 states that the revenue that comes from oil should be made public after three months but citizens are not aware of what happens to the revenue. “So you hear every day the oil is booming, they are resuming the production but we do not know what they do with money and we do not know how much they get from there,” he said. Although there are challenges, he has seen a lot of change. His story got the attention of a parliamentarian committee that went to Paloch. His writing made an impact. The committee heard the grievances of the residents in the area. They made a report but it was not made public. Other institutes like Sudd, Ebony Centre and Nile Institute for environmental health investigated into the matter as well. Because of the effects of oil production, it is very important for citizens to know that oil is good, but it can be bad if it is mismanaged. Media talking about these issues will create more awareness about the dangers of oil production. According to Environment Researcher from Sudd Institute, Nhial Tiitmamer there are a lot of pollutants that are not healthy for the environment and to the people. He said the government should facilitate a quantitative environmental and social audit to determine whether rules were followed. The environment researcher says that it will define what damage has occurred and then the damage can be quantified. Tiitmamer said the audit will be clear on who is responsible for pollution damage. He added that affected people in the can area should also be resettled far from the production and be compensated. He added that the contaminated water contains organic and inorganic compounds that dissolve and disperse oil and heavy metals that include lead and other metals that can cause cancer. It also has some solid waste, salts and dissolved gases. The environmentalist also said that the production companies should buy pond lining which is a black plastic polythene to cover the polluted oil in ponds. In 2012, petroleum Act was designed to prevent bad deals, corruption, and irresponsible investors entering the sector. According to the constitution, 2011, it says that 2 percent of the oil revenue is supposed to be given back to the locals as their compensation and then relocated to an area far from the production. Any expropriation of land for the purposes of petroleum activities should be in the public interest and in consideration for prompt full and just compensation monetarily or otherwise. The people of South Sudan should benefit fairly from the revenues derived from petroleum activities. If they cannot be relocated, the oil companies should clean up the environment. The open ponds should also be covered. The produced water that is full of toxins can be re-injected into the same wells to minimize the pollution. The government of South Sudan should state that all oil companies should use experts in high technology. New technology should be used by oil companies to clean up the environment when resuming the production. The second South Sudan Oil and Power investment conference kicks off today 20th of November 2018. For the second year, Africa Oil & Power returns to Juba to host South Sudan Oil & Power 2018. The conference, commissioned and endorsed by the Ministry of Petroleum and Ministry of Energy and Dams of South Sudan, will take place on November 20-22, 2018, in Juba. The three-day conference is expected to address the most pressing issues and opportunities in South Sudan’s oil and power industries. They include the growth of exploration activities, the resumption of oil production, regional infrastructure, security status at operational areas, and more such as oil pollution. South Sudan holds proven oil revenues totaling to 3.5 billion barrels, yet up to 70% of the country remained unexploited. The country is the most oil-dependent economy in the world, with oil accounting for almost the total exports, and around 60% of its gross domestic product (GDP). It currently produces 130, 000 barrels per day and yet it targets to produce up to 280,000 barrels per day. While the country’s oil production shrank during the 2013-2018 civil war, it never ceased for a full 100%. The government aims to restore the country’s oil sector by bringing online fields that were shut down when conflict erupted.